The 14-year wait has done no damage to Kingdom Hearts' appeal, with the latest outing flying off the shelves in its home market. Sales figures from Media Create, shared by Gematsu, show that Kingdom Hearts III sold 610,077 copies in its first week -- and that only includes retail, so digital sales will push this even higher. The game more than doubled the sales of Capcom's Resident Evil 2 remake, which shifted 252,848 boxed copies in its opening week. Sales stats for both games are solely for PlayStation 4 -- the Xbox One versions were only made available digitally in the region. While the PS4 is a virtual lock to become the third PlayStation console to reach the 100-million-unit milestone, its pace is slowing. In announcing its results for the fiscal third quarter, Sony today said it sold 8.1 million PS4s in the October-December period with what it characterized as aggressive promotional pricing for the holiday season. That total was actually lower than PS4 sales for the 2017 holiday season, which Sony said was "in-line with our expectations for this sixth year of the platform." "Although we need to be conscious of potential volatility in profitability due to the console cycle going forward, we are working to mitigate that volatility by leveraging the more-than 91.6 million unit cumulative install base of PS4 to benefit from the new business model created by network services and add-on content sales," Sony CFO Hiroki Totoki said in prepared remarks. To grab Zombiebound Reloaded, check out this link and install the VPK you download from it; the VPK is 94MB large so it’ll take a while to install. Zombiebound Reloaded is also vailable on VitaDB but VHBB crashed on my PSVita when I chose the Zombiebound Reloaded store item so your mileage may vary. Developer Markus95 has leveraged the PS2 iso functionality of hacked PS4s to run ports of emulators (PGen and QuickNES Retroarch core, respectively). As he mentions himself, these ports are not native PS4 code, but running within the PS2 emulator on the console, and will soon be made obsolete by the expected (hopefully soon?) release of Retroarch for the PS4. Nonetheless, it’s always great to have options. Sony made a rare appearance back in the news last week. We've not really heard much from the console market leader since last June (outside of, you know, launching the smash hit Spider-Man and selling a huge amount of hardware). Sony is between worlds right now. It is working on its next-gen strategy, but it can't talk about that just yet. It has a new structure, but it's still tweaking and finalising. It has some big games coming out, but we know about them already. Sony, at this point in time, doesn't have a lot to say. That is backed up by the absence of its usual European press conference or the PlayStation Experience last year, and its decision to forgo E3 for the first time in almost 25 years. Sure, this does open the floor for Nintendo and Xbox to waltz around unimpeded. But I'm sure the top brass at Sony will make do with its award-winning games and record-breaking console sales in the mean time. So it's nice to see Shawn Layden pop up in the news last week, with a handful of interviews and a keynote talk at DICE. "Layden's comments feel a bit harsh, especially when you consider how some of the most significant PS4 moments took place during E3"
Layden was candid, but in a controlled away, with plenty of talk about past mistakes and how great its competitors are -- it was right out of the Phil Spencer PR playbook. Yet Layden couldn't resist dishing out a bit of criticism, too, and he reserved it for the world's biggest video games event: E3. "When we decided to take video games out of CES back in 1995, during the PlayStation 1 era, E3 served two constituencies: retailers and journalists," Layden told CNET. "Retailers would come in -- you'd see a guy come in, and he'd say, 'I'm from Sears, and I handle Hot Wheels, Barbie, VHS and video games. So what are you about?' There was a huge educational component. Sony is poised to end production of PlayStation Vita in Japan, the last bastion for the eight year old handheld. The official PlayStation Japan website lists only two models of the PS Vita as still being available: PS Vita Black and PS Vita Blue. In both product descriptions, it states that "shipments are scheduled to end soon". This is in line with comments from PlayStation Japan last September, when it confirmed its intentions to end hardware production in 2019. While no date is mentioned, this is the first indication that the moment will soon arrive. As Gematsu highlighted, when Sony ended production of the PlayStation 3, the official Japanese website featured the same notice two months before. In addition to the Black and Blue models still in production, PlayStation Japan lists another 55 models that were previously available -- a huge number, a testament to both the Vita's status in Sony's home territory and also its waning popularity. 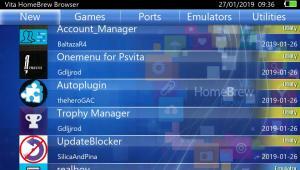 The PSP and the PSVita have a decent amount of homebrew in common such as Tyrian, Super Mario War, Minicraft and others. However, there’s one homebrew that few expected anyone would try to port to the Vita and that is DaedalusX64, the PSP’s Nintendo 64 emulator which only works somewhat well because the N64 and PSP share the same CPU architecture (MIPS). DaedalusX64does a pretty admirable job at emulating the N64 considering the hardware it’s working on and can actually deliver playable framerates on titles like Super Mario 64 and Mario Kart 64. Recently, there’s been some work to improve its performance, stability and compatibility with some titles by z2442 and others; updated versions resulting from this work can be downloaded from here. As of right now, the folks behind this porting effort haven’t been able to compile/build it for the Vita but this might change in the near future although it’s unlikely that it would perform too well. From some comments on the Reddit thread about this port, TheMrIron2 (who contributed to the aforementioned updated DaedalusX64 builds) states that there may be an attempt to access the PSP hardware found inside the Vita’s SoC to improve emulation performance although this idea has never been employed in any homebrew in the past and it’s unknown whether it’d work. For more information about the matter, you can check out this Reddit thread and get on the PSP Homebrew Server Discord channel as that’s where TheMrIron2 and other people behind this port seem to be discussing stuff. As recently mentioned, the Switch already has a port of Super Mario War and while the PSVita also had a port of this game by Rinnegatamante, it wasn’t fully stable. 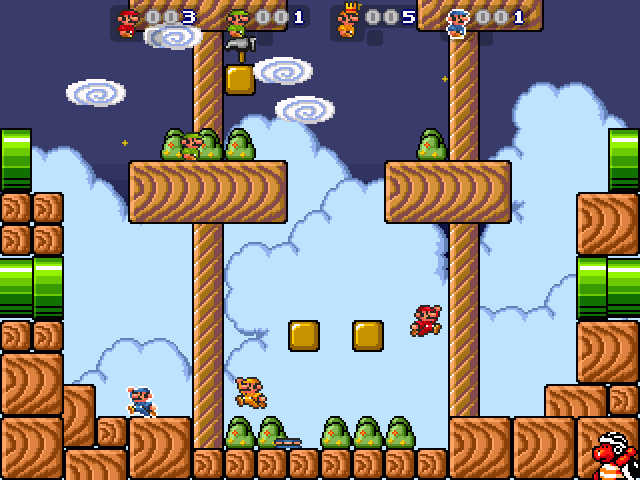 Similar to Jump’n’Bump, Super Mario War is a multiplayer-focused game in which you must stomp on other Marios to score points and it has Super Mario Bros 3-esque graphics and sounds. To spice up gameplay, it has many different game modes like jail/coin collection and many maps so you and your friends are unlikely to get bored of it very quickly. Thankfully, it also has easily accessible AI functions so you can play alone or add another computer-controlled player or two when playing with family/friends. To grab this updated version of Super Mario War, follow this link to get the VPK or grab it directly off VHBB because it’s available on VitaDB. 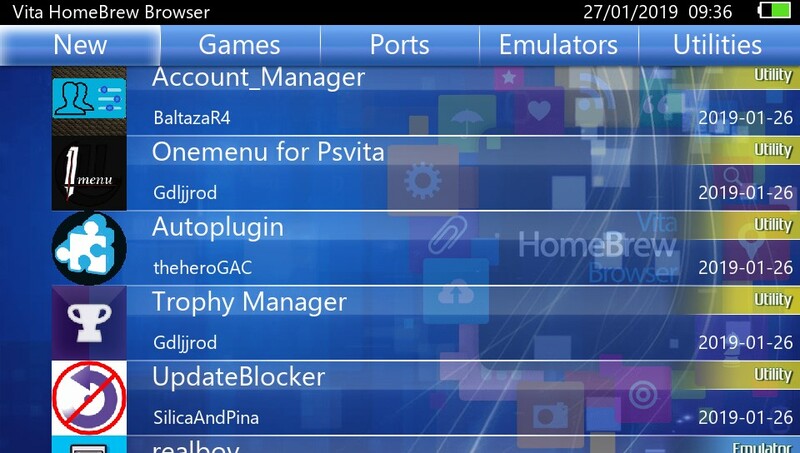 VitaBright by devnoname120 is an essential plugin that lets you take control of the PSVita’s screen brightness. In other words, it allows you to set the maximum brightness above the limit set by Sony and the minimum brightness below the limit. A bug, that occurred when you were using the lowest brightness setting, in which the brightness would go back up after the screen dims due to inactivity was finally fixed! To grab VitaBright 1.0, follow this link and download the ZIP file provided. The ZIP file contains the plugin in SKPRX form which you have to copy to ux/ur0:/tai. After copying the plugin, all you have to do is add the plugin’s directory under the *KERNEL section by inserting something like “ux0:/tai/vitabright.skprx”. You may also make use of custom gamma tables but the plugin has default settings built in which are fine for many users, myself included. Other than VitaBright, another plugin also saw an update and this is VitaGrafix by Electry. VitaGrafix 4.1 is a technical update that mostly aims at making the life of people who create game patches easier. Recent commercial game patch releases include internal buffer resolution patches for Fate/EXTELLA [US/JP/ASIA] and Valhalla Knights 3 [EU/US/JP] along with offsets for all regions of RESOGUN. While VitaGrafix 4.1’s updates have to do stuff that the end user doesn’t directly mess with, it’s still a good idea to update your VitaGrafix plugin since newer game patches may make use of features introduced with this release. To grab the updated version of the plugin, check out this link and follow installation instructions from here. If you’re a fan of the crazy chipmunks that go by the name of Chip ‘n’ Dale, then you’ll be pleased that Reddit user “tijesef” ported Chip And Dale Remastered to the PSVita with help from YellowAfterLife! 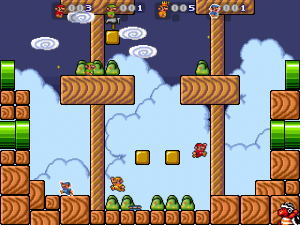 This Chip & Dale game is a remake of the NES game “Chip & Dale: Rescue Rangers” and it’s made with GameMaker 8.0 so it was obviously ported to the PSVita with SilicaAndPina’s G*Maker. Undoubtedly, Adrenaline is one of the most (if not the most) used PSVita homebrew available since it lets you turn your Vita/PSTV into a fully-fledged PSP. As a result, most of its bugs have already been ironed out and releases have slowed down but occasionally, TheFlow allows it an update and now, Adrenaline 6.8 has been released. Adrenaline, by TheFlow, is an ePSP hack for HENkaku/taiHEN-enabled PSVita/PSTV consoles running FW 3.60-3.68. Adrenaline gives you the full XMB experience which you can further customise to your liking! What does Adrenaline 6.8 bring along? ◾ A fix, by rsn8887, for the slowdowns encountered when emulating certain PlayStation 1 titles. ◾ Support for h-encore 2.0 which can come in handy if you’re still on FW 3.67/3.68 even though you shouldn’t be since modoru lets you downgrade to FW 3.60/3.65 thus letting you use HENkaku Enso (hacks at boot time). 5.Obviously, this requires you to have Adrenaline already installed and should only be done if you have Adrenaline 6.0 or above or installed. If you don’t have Adrenaline installed or have an ancient version, you can install it by downloading the VPK, installing it through VitaShell and then copying the PSP FW 6.61 PBP file to “ux0:/app/PSPEMUCFW”. Yesterday, CelesteBlue released Memecore, a port of h-encore for older firmware 3.60. Support for 3.5x firmwares is scheduled for the days to come. Memecore is the successor of memekaku, that enabled us to install henkaku on older firmware such as 3.55. 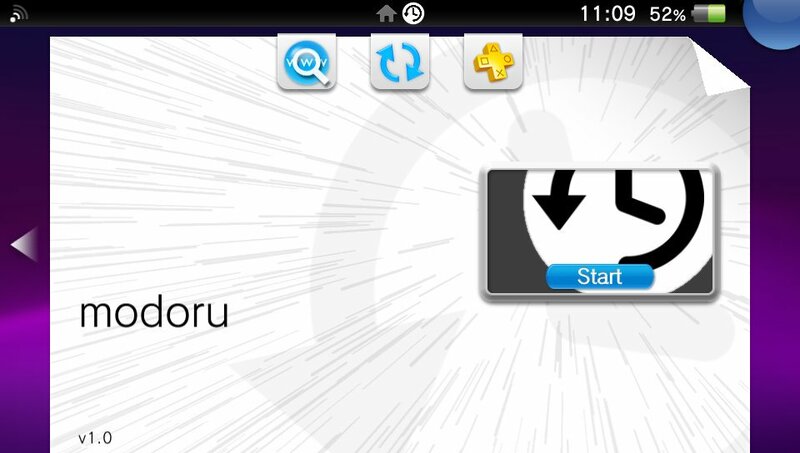 This release announces the end of memekaku support and a new way of exploiting your PS Vita (using the h-encore exploit) so it’s more reliable than memekaku. And guess what? You can also use it on 3.60 so now you have both the browser exploit and the h-encore exploit. If you have problems using the web browser to install henkaku, you can now count on memecore. This release enables us to rediscover old exploits such as rejuvenate, failmail, TN-V while keeping HENkaku, but will also helps developers to reverse engineer old firmwares. This release was possible thanks to the latest release of h-encore 2.0, which has updated the kernel ROP chain to use gadgets that are also available on lower firmware so it is easier to port it to said firmware. You can download memecore from the developer’s github here. From CelesteBlue: You can use the provided system.dat, or build on Linux it by typing ‘bash memecore.sh ‘. A couple of months ago, we all saw the reveal of several low-level breakthroughs in Vita hacking, such as the “octopus” F00D exploit, BootROM exploitation through voltage glitching, and more. A “master key” was unveiled, and several new opportunities such as reF00D and memory card readers became possible. But was ittruly the end for PS Vita security? As we learn from the new article published by hacker Yifan Lu on his blog, it wasn’t there just yet. One could already say so, given how the 3.70 firmware update changed the above “master key”, and even though it was possible to recover the new one using the glitching setup and crypto engine vulnerabilities, there was no direct knowledge of one of the console’s biggest secrets: hardware keyslots. After all, if something is changeable, there has to be something else above to protect it. Something permanent. And as soon as it’s found, the protection is no more. What do “hardware keys” mean? If we want to see how content (games, data, firmware, updates, etc) is decrypted, we have to look at the F00D processor, which is a satellite processor that handles all the cryptographic and security critical tasks. F00D runs on a largely undocumented architecture but we were able to hack it in due time. However, even hacking F00D is not enough to fully “own” the system. There are many cryptographic keys inside F00D code, but the most important keys including the ones that decrypt the bootloader are hidden away in the silicon and only accessible by the hardware AES engine we call Bigmac. There are 250 of these keyslots. 30 of these keys are called “meta” or “master” keys because Bigmac is only allowed to use them to encrypt data to another keyslot (i.e. to derive keys). It is not possible to directly use the master keys to encrypt data and see the ciphertext. Most of the keyslots (including all the master keys) are locked before the bootloader is executed. That means only the boot ROM is allowed to use them in Bigmac. So, to summarize the roadmap, here is what we had to have hacked before even getting to this point: WebKit to gain initial execution, ARM kernel, ARM TrustZone, F00D kernel, and F00D boot ROM. Starting from scratch, it took us six years to get to this point and with the exception of F00D boot ROM, it was all done with software vulnerabilities. (We have dumped all our knowledge in a community-maintained wiki.) A reasonable observer might wonder what the point of all this is. For all practical purposes, hacking ARM kernel is enough to jailbreak the system, run homebrew and mods, and (unfortunately) pirate games. However, the reasonable observer would likely have no fun at CTF events. Six years ago, I set an arbitrary goal for myself: to get the decryption key for the bootloader. The idea is that if we can decrypt the first piece of loadable code, then there is nothing Sony can do to hide code in future updates. Later on, this “root decryption” key gained a name: slot 0x208 (a meta key). This post is on capturing that final flag, the last leg of this six year journey. In his blog post, Yifan Lu provides an extensive description of the methods used to attack hardware AES and obtain the keys. It even comes with an academic paper that goes into technical details of the attack, and how it works to exploit the Vita’s keyslots, with a good bit of linear algebra in-between. How is this useful in the end? Below are some, but not all, of the practical advantages gained by this research. DecryptionThe direct result of this accomplishment is that all components of the PS Vita system software, as well as other software such as games, are now permanently decryptable, no matter what changes Sony decides to make in future firmware updates. It also considerably simplifies the process of decrypting new firmware files standalone (e.g. on a PC) without having to perform the hardware attacks to find the master keys every time. Decryption of firmware files ensures that hackers always have access to finding more vulnerabilities and other goodies in newer Sony updates. This includes, but is not limited to, always being able to spoof the latest firmware (in all of its senses) in case Sony re-introduces harsh verification measures for activating your console and downloading content from the PSN. For anyone working on emulating the PS Vita, as well as creating open software and hardware to interface with its storage media, this opens the doors to their proper implementation and removes much of the dependency on a real PS Vita to do its job. For example, standalone dumps and creation of authenticated SD game carts, as well as Sony memory cards, are now much closer possibilities given that the crypto barrier is effectively removed. This also removes the need in F00D-level and BootROM-level code execution exploits in order to perform most crypto tasks. However, some of the hardware keys are device-specific, so the aforementioned attacks technically have to be performed on every single device in order to get them. Among those are your NAND (internal memory) decryption key and the key used to uniquely encrypt the idstorage (which securely stores information identifying your Vita). The latter still warrants F00D-level code execution as the most practical way to clone (decrypt and re-encrypt) an idstorage from one console to another, which is currently thought to be one of the ways to lower the “Factory Firmware” requirement in the recently released modoru downgrading utility. Will this help with 3.69+ hacks? While this does mean that the Vita is completely “owned”, there is still a distinction to make between being able to decrypt code and being able to execute it on the device. The latter heavily relies on another type of security called “asymmetric cryptography”, which, when implemented properly, is impossible to break without pure brute-force (because it relies on private signing keys that only Sony themselves have). Therefore the only “universal” way to run code on any firmware is via Yifan’s BootROM glitching, which technically gives you the freedom to run almost anything you want on your device, all the while being a very impractical “modchip on steroids” solution. As it stands, the most accessible ways to hack your Vita and run HENkaku on it are still software-triggered exploit chains such as h-encore, and you still have to wait for new exploit chains to be released for your firmware. This was previously mentioned in the context of a possible F00D hack: hacking lower levels of the PS Vita security is not directly associated with what we understand as a “Vita CFW”, but mostly serves the purpose of demonstrating how to crack even the toughest “nuts” of the device’s security. All in all, while not being of any obvious benefit to the end user, this is a serious technological achievement. It demonstrates to what lengths console manufacturers can go to secure their devices, and what effort hackers need to put into cracking all of the protections. Experience gained hacking the PS Vita may eventually be useful when new, potentially more secure consumer devices come to the market, and it reinforces the natural desire for knowledge that drives so many researchers to do their job. It is worth noting, however, that (for legal reasons) the hardware keys will not be released by Team Molecule. This is why Yifan Lu has only posted hashes and not the keys themselves. Fortunately, all the tools used for this endeavor are publicly available on Team Molecule’s GitHub, so anyone who is keen on obtaining such secrets can now try and reproduce the setup at home. Yesterday, homebrew developer VitaHEX released The Hallway, a horror-esque game made using the Unity engine running on the PS Vita. It’s based on P.T., a horror game that was meant to be a new addition in the Silent Hill game series. Below is a quote from the developer himself about the game. “This game is a recreation of my all time favorite PT demo. In the PS Vita version I call it “The Hallway” (for obvious reasons). It’s a complete recreation of the original with handmade 3d models and environments I created as close as possible to original. After playing it myself, I can guarantee that this game will keep you on your toes the entire time and seeing his other projects such as Zombiebound Reloaded and Vitamon GO!, I’m sure what’s next in store for us will be even better. You can download the Hallway here. For the past couple of months, I have been trying to extract the hardware keys from the PlayStation Vita. I wrote a paper describing the whole process with all the technical details, but I thought I would also write a more casual blog post about it as well. Consider this a companion piece to the paper where I will expand more on the process and the dead ends than just present the results. In place of technical accuracy, I will attempt to provide more intuitive explanations and give background information omitted in the paper. For a nice practical introduction to differential fault analysis, check out this article on using DFA to attack white-box software AES. The authors give a good explanation that is not overly academic and actually presents code at the end (which we use for our attack). The main idea of DFA is this: we can use glitch attacks on AES hardware just as we can on processors, but instead of using it to control code execution, we use it to make faulty AES encryptions with the right key. Since AES is a brittle algorithm, slight modifications will cause it to leak information about the key in unintended ways and we abuse this fact. Unfortunately, there is not much interest in AES DFA outside of academia. A search on Github shows a handful of results and overall we only found two serious implementation of AES DFA attacks. dfa-aes is an implementation of a 2009 paper where a single precise fault in round 8 and 2 32 232 brute force can yield the AES-128 key. phoenixAES (from the authors of that article linked to above) is an implementation of a 2003 paper which requires two separate precise faults in round 8 and no brute force (although later on, we will later describe some modifications that relaxes the “precise fault” requirement and increases the required brute force to about 2 8 28). There has been many other papers published from 2002 to 2016 describing attacks that assume faults in earlier rounds or more bytes are affected by a fault or other parts of the algorithm. However, we were not able to find any source code attached to these papers. In the end, we derived our work from phoenixAES even though it was not state-of-the-art because writing code is boring and most of the improvements in the literature do not mean much in practice (one hour vs five minutes is a lot of time but if you only have to do it once, the time it takes to write all that code and debug it would negate the gain). With that rant aside, the main bulk of work is in perfecting our glitching setup in order to inject precise (as in corrupting no more than a single byte) faults on the AES engine during round 8. Once we have that in place, we can feed the collected samples into phoenixAES (or dfa-aes) and it should Just Work. Before getting into how we designed the setup for DFA glitching, it is worth sidetracking into our (failed) attempt on a DPA attack on the Vita as context for some of the design decisions made later on. Differential power analysis is a type of side channel attack where if the attacker observes the power consumption of the AES engine while it is operating with a secret key, then it is possible to leak the key. First she hypothesizes the value of a part of the key. Next, the attacker defines a power usage model of the AES engine to predict how much power is consumed if a random input is encrypted and the hypothesis was correct. Finally, she actually runs the engine with that input and measures the actual power consumption to see how close the prediction was. By repeating this many times and for different parts of the key, it is possible to find the entire key. Chipwhisperer wiki has a great introduction to how differential power analysis works that goes into much more details but is still approachable.